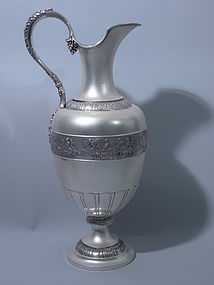 Large sterling silver Neoclassical ewer. Made by Tiffany in New York, ca. 1885. Ovoid body, helmet mouth and spout, scrolled handle, short stem with knop, and dome foot. Body encircled with Classical military frieze on stippled ground. Lower body has low-relief lobing. 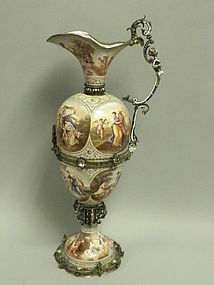 Handle is reeded with foliate cap and mount, and terminates in grape bunch. Knop and foot decorated with foliate and and stylized dentil ornament. Monumental. Hallmarked. Excellent condition.